These are too cute!!! I love to check in and see what you're working on...thanks for sharing! Very cute! 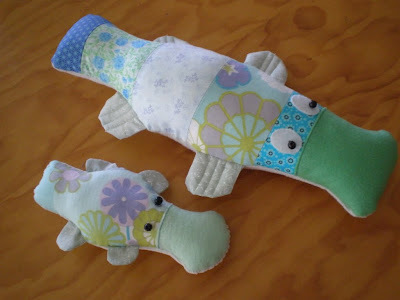 Kate from Two Little Banshees does great softie patterns. Love your platypus...they are so cute. I like the bigger one! It looks like it's ready for some mischief. these are adorable! Very cute blog. Oh, these are adorable! I would love to make one too - thanks for sharing. I'm really into softie making at the moment.